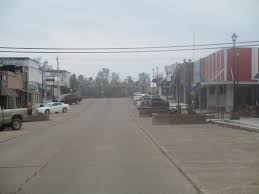 Broken Bow was a lumber and farming town situated in the rolling hills and green forests of the "Little Dixie" Baptist bible belt of southeastern Oklahoma. The town sat nine miles west of Eagletown, an important Indian trading community on the Arkansas border back when the two states were known as Indian Territory. Eagletown, now reduced to no more than a nondescript service station, huddled beside the highway as busy travelers whizzed past without noticing. Broken Bow began life as an Indian village called Con Chito. Over the generations, it waxed and waned and died and revived until two brothers by the name of Dierks incorporated the community in 1911, naming it after their hometown in Nebraska. The town of roughly 2,500 souls fastened itself to the narrow blacktop highway coming in from Arkansas and the railroad tracks paralleling the road. Most commercial businesses clustered along the two paved downtown streets running north from the highway and a couple of graveled roads pacing them on the east and on the west. The Dierks Lumber Company sawmill, the town's largest employer, lay on the other side of the railroad tracks where the highway turned south and ran twelve miles through open farm country to Idabel, the McCurtain County seat, and beyond to the rich river bottoms. From there, it crossed into Texas after another twenty miles. Broken Bow was the kind of place where no one knew his own address. A family lived three blocks east of the feed store and one block south, second house on the left, or some such descriptive direction. There weren't even street signs when I was a child. Nor was there postal delivery, except for rural routes. Town mail was collected from rented boxes or the free general delivery window at the post office. Generations of children measured their growth by running down the sidewalk on Main Street and jumping to touch the rafters of the wooden overhang protecting pedestrians from the blazing sun or heavy rain squalls. The drug store on the uphill corner of this block-long shaded section boasted a soda fountain, making it a magnet for the younger set. The town's most popular Saturday night pastime was parking head-in to the curb along the main drag as near the drug store as possible. Entire families sat in cars and trucks to indulge in some serious people watching until it was time for the picture show half a block down on the other side of the street. It was a good way to keep up with budding teenage romances and the state of the neighbors' marital relationships. Sartorial splendor was considered anything beyond a gingham house dress and bib overalls. The Broken Bow High Savages annually engaged the Idabel Warriors in the "Little River Rumble," one of the oldest football rivalries in the state. Back then, the schools were segregated, of course, and remained that way until 1964. In fact, although were were in the midst of the Choctaw Nation, I don't recall attending class with any Natives except two boys a few years behind me. However, the school secretary was a Native American... a Hopi from distant New Mexico. For what it's worth, the first year that two black players were permitted on the team, Broken Bow High won the championship in their division. I fondly remember the town as an easy-going, not-much-happening place where my grandmother and I rocked on the porch in the early summer evenings, while my grandfather sliced open a plump, red-meat watermelon. The setting sun caught in the topmost branches of the chinaberry tree in the front yard and played among leaves ruffled by a gentle breeze. Often, as heat waves slowly dissipated on the asphalt highway and the delicate scent of roses and hydrangeas and morning glories flooded the porch, we'd hear a family on the far side of the railroad tracks harmonizing familiar gospel songs. Sometimes we joined right in. I've always wondered if they heard us as clearly as we heard them. Ah, those were the days. At least, that's the way I view them from today's perspective. In truth, they were as stressful and troublesome as those I sometimes experience today. The problems were just appropriate to the time. I hope this re-post provoked thoughts of your own times past. Be happy to hear from you at dontravis21@gmail.com. As always, thanks for being readers. New blogs are posted at 6:00 a.m. each Thursday.